Video is where this movie belongs. If you're a fan, it's a keeper. If you're not, watch a few episodes first. Successfully super-sized but otherwise no different from an episode of its TV inspiration, "The Powerpuff Girls Movie" is a wait-for-video flick if there ever was one. Don't get me wrong -- I'm a huge fan of "The Powerpuff Girls." I'm such a huge fan that my favorite Christmas present last year was a trio of stuffed Powerpuff Girls I got from my girlfriend. I keep them next to my bed. You got a problem with that? But like most entries in the currently trendy TV-cartoons-stretched-to-feature-length-films genre, this movie doesn't do much to justify its big screen status. Based on Cartoon Network's endearing, ingenious and inventively animated show about three kindergarten cutie-pies who happen to be superheroes, the picture does at least pick for its plot an unexplored part of the program's lore (which is more than can be said for the greed-driven drivel of last week's "Hey Arnold! The Movie" or any of its Nickelodeon-spawn brethren of the last few years). 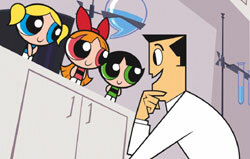 The story concerns the origins of the Powerpuff Girls, who were created by Professor Untonium, a square (and square-jawed) inventor who was so frustrated with life in the crime-riddled metropolis of Townsville that he decided to bring a little sweetness into his life by mixing sugar, spice and everything nice to make himself a perfect daughter. When he accidentally spilled a substance called Chemical X into the mixture, three precious little super-girls were born -- sensitive, giggly blonde Bubbles, bold redhead Blossom and irritable brunette Buttercup. But creator-director Craig McCraken covers all this potentially story-rich territory in the movie's opening scenes, which also all-too-vaguely allude to the origins of the girls' arch-nemesis -- a monkey named Mojo Jojo who has a giant, skull-popping brain and a hilariously redundant way of speaking in egomaniacal rantings and ravings. With what could have been a half-hour of the plot reduced to five minutes, "The Powerpuff Girls Movie" proceeds to pad other scenes to the point of redundancy in order to reach its 80-minute run time. When the girls' first-ever game of tag goes horribly wrong (they virtually destroy Townsville trying to evade each other), it's in a scene that would have been summed up in 30 seconds on the TV show. But here it drags on for about five minutes. The climactic fight scene against Mojo Jojo and an army of super-monkeys he's bio-engineered is full of the kind of pow!-powered cartoon punches "The Powerpuff Girls" program is famous for. But again it drags on and on. Except for the fact that McCraken has taken the liberty of making the story a little darker than fans may be accustomed to, the whole movie easily could have been a half-hour episode of the show, which is always an endlessly amusing combination of good moral lessons, great characters, funny monsters, and a deliciously subtle sense of irony. All the program's charm is present in the movie, but it's spread too thin. The brilliantly unique, saucer-eyed and semi-surreal "Powerpuff Girls" animation style is there to hold your attention even when the story doesn't. But I'd rather pay to see another matinee at the multiplex, then rush home in time for a smaller, more potent dose of "The Powerpuff Girls" on afternoon television.